Frey is a weapon. Raised from a young age to act as a body double for her twin sister, Rafi, Frey’s primary job is to keep her sister safe, whether that means taking on assassins or playing her sister in dangerous situations. When her father sends Frey to a neighbouring city, in Rafi’s place, for the first time in her life she finds that more and more she is playing herself, but having played her sister for so long will Frey know who she really is...? 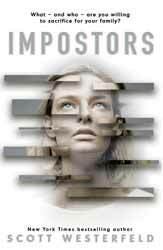 Impostors (2018. 405 pages) is a young adult science fiction novel from Scott Westerfeld, known for his Uglies and Leviathan series of novels. I am guessing that this new novel is part of a series, as the book does not so much end as come to an abrupt stop, with most of the plot points still unresolved. The book is set in a future America, although the country no longer exists. The world building is not particularly explicit, even working out where you are takes a little geographical detective work. Frey’s world has been severely depopulated, or at least the story gives that impression, the book hints at an ecological breakdown rather than a nuclear war. What is left is akin to the BC Greek city states. The original cities have been abandoned and yet the technology within the book is noticeably more sophisticated than today’s machines, with flying vehicles, dust that can be used as material to spy on a population and weapons which can both fly and respond to the users commands. Therefore there could not have been a total collapse of civilisation. In this new world people live in cities ruled predominantly by single families, though there is no prescribed form of government. Frey’s father rules as a tyrant, using fear and threats to keep his population in line. His city is built of steel and concrete. In this new world steel is a precious commodity, which can be stripped from the crumbling ruins of the old cities, precious enough to fight for, precious enough to die for. Frey’s father is obsessed with not losing to anybody so he has created a ruse to keep Rafi safe. Rafi and Frey are never seen together, while Rafi is taught French, how to be stylish and all the other requirement of a daughter of a powerful man, Frey is hidden away, only coming out to imitate her sister when she is needed as a bullet magnet. Not everybody agrees with the strip mining of the old cities and rebel groups feel that it will lead to more ecological disasters, as when the cities are depleted the families will recommence the strip mining of the planet resources. There is also tension between the various cities and it is for this reason that Frey is sent as a hostage to a neighbouring city who hope to use her father’s extensive army to drive the rebels away from the rich resources of the old city. The book follows Frey who is in one sense a hostage, but also strangely freer than she has ever been. True she must pretend to be Rafi because that is who the city thinks they are playing host to, but in Col, the son of the cities ruler, she starts to find an ally, maybe even a friend and for once in her life Frey starts to be herself and not a pale imitation of her sister. Westerfield must be a fan of Frank Herbert because the story replicates many elements found in Dune. There is the consideration of the ecology and limited recourses which causes war between families. There are also survival suits which collect bodily fluids and turn them back into drinking water. Frey’s overall arc of losing her family only to join with a smaller rebel faction has tones of Paul Atreides story arc. Overall, I liked the book, but this is because I liked Frey as a character. She is well written and has definite character progression. She is introspective and so you spend a lot of time with her thoughts and feelings. This concentration on a single character only becomes an issue if you do not find Frey either interesting or compelling.